Free Standing Bridge Crane Manufacturer Provides Mobile Crane Cheap Crane Portable Crane! 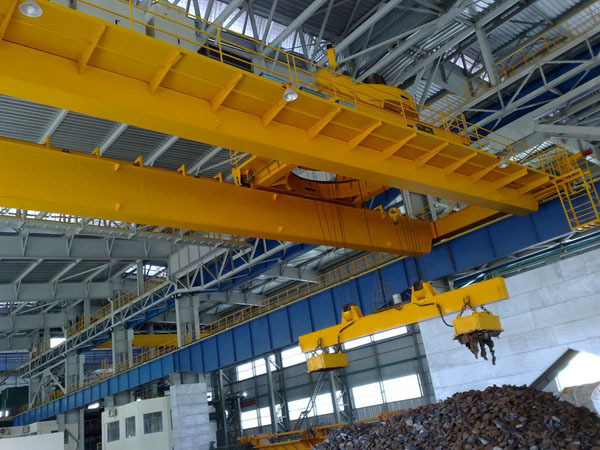 Free standing bridge crane is kind of light and small lifting equipment, it is used for lifting and transporting materials in the small factory or storage, especially for modern production line. 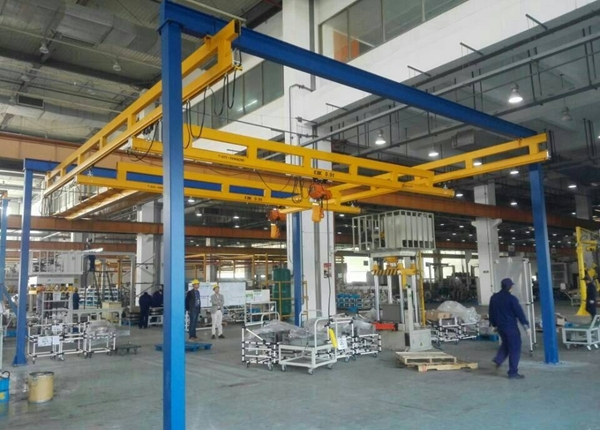 Workstation freestanding crane has many advantages, such as wide application, light weight, low headroom, easy to install and repair. Ellsen Company, a great supplier and manufacturer in crane industry, provides kinds of overhead freestanding cranes with top quality and dealer price. 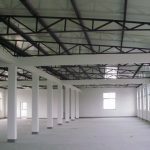 Free standing cranes are widely used in the working places those don’t have enough room for overhead crane installation. 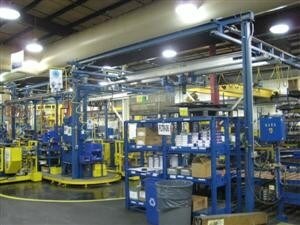 Because free standing crane has low headroom and can maximize lift and take full advantage of the room. As a kind of portable bridge crane for factory, it has lightweight and compact structure, very convenient and easy to use. 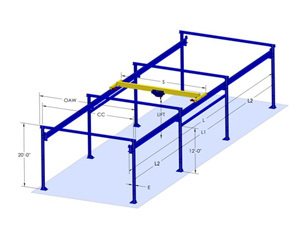 Why choose free standing bridge crane? Free standing lifting crane is suitable for some factories those are not designed for overhead crane installation in the beginning. 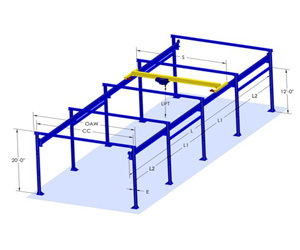 The girders and supporting structure are connected by bolts, not welded, so it is quick and easy to install and relocate. 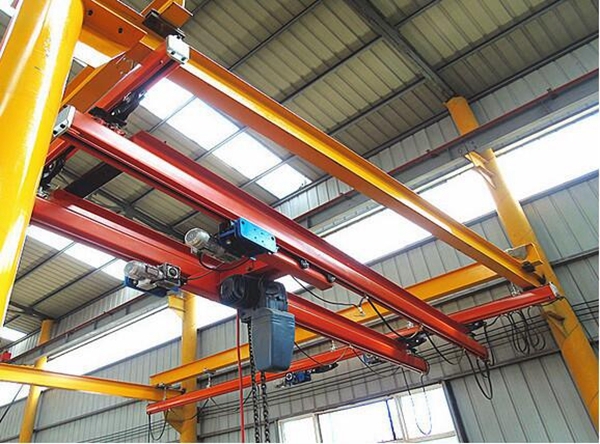 Steel frame of the free standing crane is combination of cold-rolling tracks. 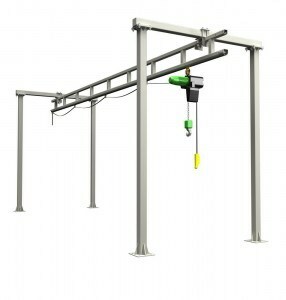 Track travelling line can be arranged along the production process, and turning, crossing, gauge changing are included. 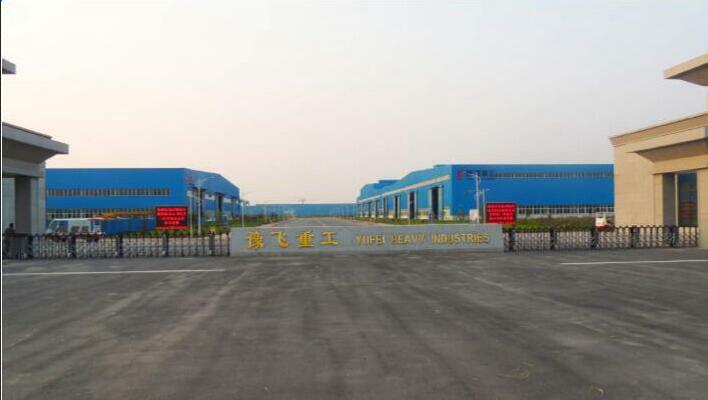 All crane components can achieve mass production, and crane parts can be combined to different flexible cranes according to customers’ needs. This kind lifting crane has many advantages, such as good combination property, convenient to use, maximize the working room, low operating cost. It has manual type and automatic type. 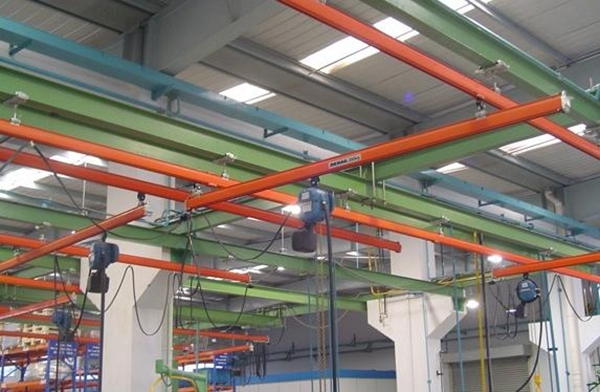 It can be combined to underhung system, single girder underhung crane, double girder underhung crane. What is the worst thing about a crane that you are getting for the site? You will care about the look, feel, and installation process. You will also want to think about how it is going to lift what you are lifting on site. If it is not sufficient for that material, you won’t be able to get it. The free standing bridge crane is a favorite for a lot of people and something people can get behind in the long-term. Here is why the free standing bridge crane is the best. If you are an owner that has a smaller area, you will know that space is everything. You are not going to be able to skip these things unless you are happy with the crane getting in the way. If you are a person that knows how important space is, you will look for a smaller choice that is robust and efficient. If that is what you need, the free standing bridge crane is the only one you should be going for. it is not going to take up a lot of space and will look good while it is working for you. It is lightweight, and that is convenient for those who are setting up the crane in a smaller space. You want it to be unassuming as that is critical. When you are not getting a lightweight crane, you are putting something that is cumbersome and getting in the way. What is the point of a crane that is causing more trouble than good? Do you want a crane like that to be at the helm of your project? No, you want the crane to be lightweight, and this is the best in that regard. If you are not able to get the crane installed, you are not working on the project, and that is money down the drain. If you are not able to install something, you are going to lose big time, and that is not good enough. You should make sure the installation is simple, and that is the power of a good free standing bridge crane for your project. Look at all of the angles that come into play and you will love how the crane sets up. It is just going to work on your site regardless of the dimensions and layout. You want to look at these things because when you are getting a crane, you don’t want it to be a serious liability that is going to become troublesome. A crane is supposed to by your ally as you are deciding to put things together. You don’t want it to be the enemy for your project. 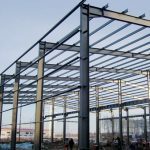 If a project is not getting off the ground, you don’t want the crane to be the reason for this hesitation, and that can be problematic for a lot of people moving ahead. You want to feel safe, and this crane will let you feel good. When it comes to building projects, there are many pieces of heavy equipment that can be useful for your team to use. 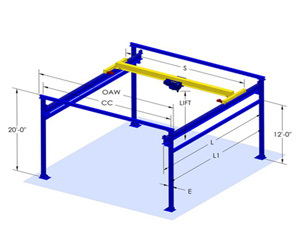 For instance, a free-standing bridge crane can help you to get things moved quickly and easily that would otherwise be very challenging for your staff to move manually. In fact, the use of machinery such as this has dramatically improved the construction process in the past hundred years. 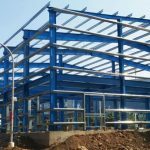 If you are planning to begin a construction company of your own, you will need to have some pieces of equipment to begin with. 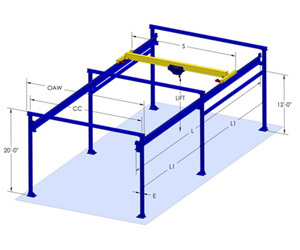 You may want to consider investing in a free standing bridge crane as a part of your initial supplies. Of course, it will depend on exactly what your needs will be once you open the doors so to speak. Of course, you will likely not have the funding needed to purchase everything when you first open your business to the public. In this case, you may be able to rent out the additional equipment as needed until you are able to finance it on your own. This is preferable to extending your credit to the limit for tools and equipment that are not needed for every job. 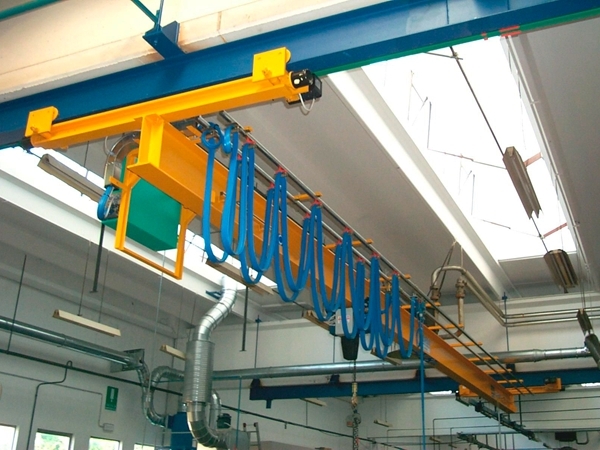 Bridge cranes are commonly used in industrial settings to speed up and simplify the process of lifting and moving heavy loads. These cranes have legs on either side that are connected by a heavy-duty beam. The beam, which has a hoist attached to it, essentially forms a bridge over the work area. Heavy loads can be attached to the hoist and moved back and forth across the bridge. 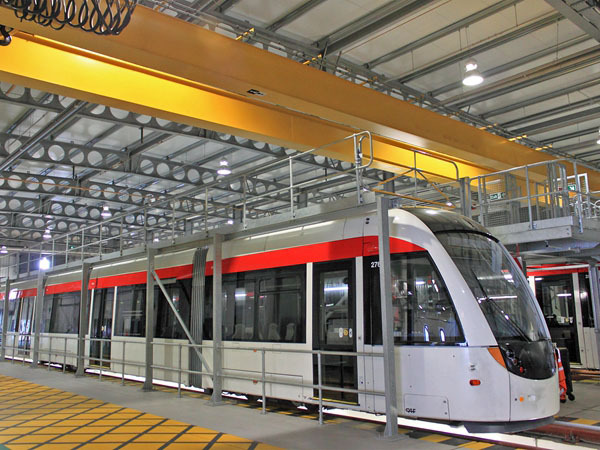 One thing that sets bridge cranes apart from standard overhead cranes is that they are also usually attached to a set of wheels or a track. This allows them to move horizontally across the ground. 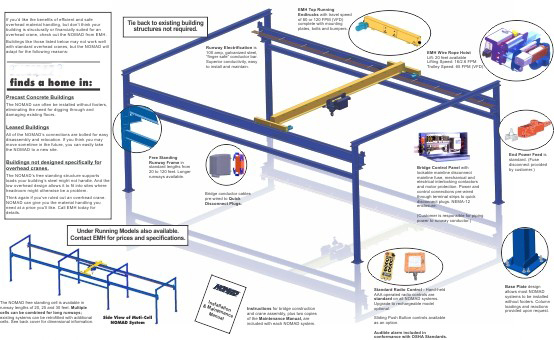 As a result, the crane can be positioned at just about any location on the loading dock or factory floor. 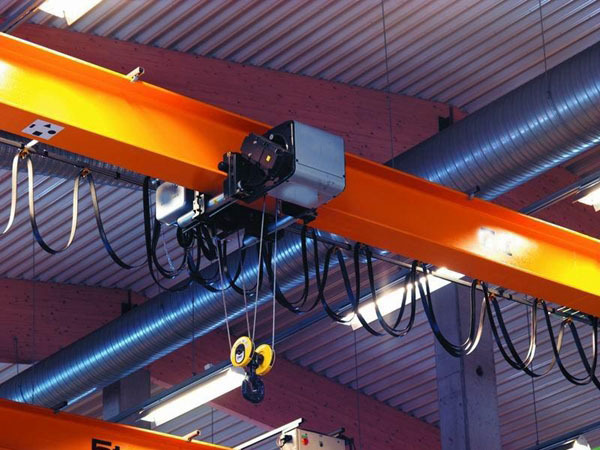 This provides a tremendous amount of flexibility for businesses that use these cranes. Rather than being limited to loading and unloading goods in just one location, a bridge crane allows a business to lift, transport, and unload goods over a much larger area. 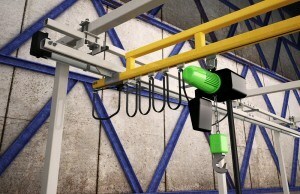 This makes them a far more efficient option than a stationary overhead crane.